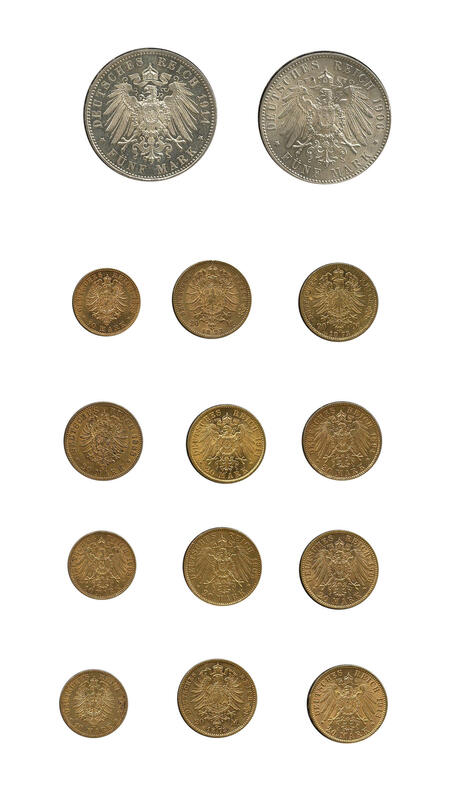 3158 c inF Extensive inventory coins of different countries from Europe and oversea. As well interesting examples including gold coins of different areas, all in three boxes accommodated. Please check carefully! 3159 c inF Interesting collection of 30 single- and double ducats, predominantly Austria and Hungaria, all with handle tracks, partial punched. As well sought examples! 3160 c inF Interesting collection coins of the German Demokratic Republik, as well the commemorative coins, as well a few regular issue coinage sets, medals, and so on. Please have a look! 3161 c inF Extensive lot coins from the Euro time in two boxes accommodated. As well mainly 2 Euro pieces including Papal States, San Marino and Monaco. Please have a look! 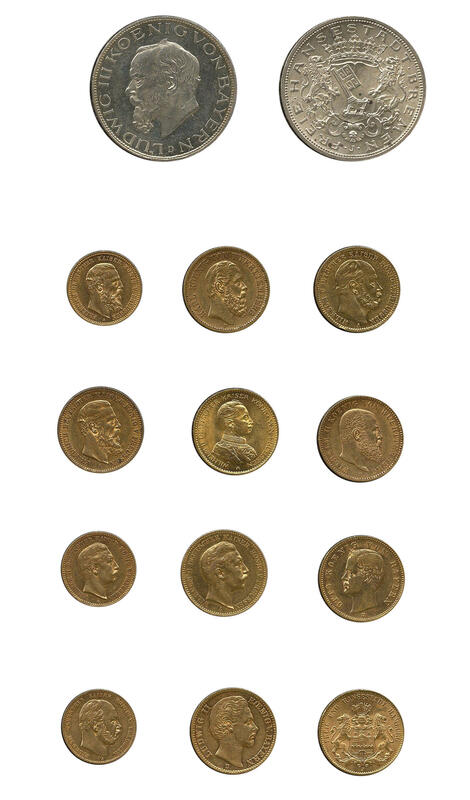 3162 c inF Extensive inventory coins in two boxes accommodated, with also older examples of the German Reich, numerous commemorative coins Federal Republic of Germany up to the euro time, as well also two gold coins. Please have a look! 3163 c inF Interesting lot of coins of different areas, with also various current coin and commemorative coins Federal Republic of Germany, as well also 10 gold coins. Please have a look and calculate! 3164 c inF Interesting collection from 12 gold coins from Austria / Hungaria and Netherlands, all older issues. An attractive object! 3165 c inF Interesting lot commemorative coins Weimar Republic, as well inflation and Third Reich. As well sought examples and motives, in a casket accommodated. High trade value! 3166 c inF Small lot coins, as well a few silver coins, as well two gold coins (restrike mint). Please have a look! 3167 c inF Interesting lot of 10 gold coins from Great Britain, German empire, Sweden, Russia, as well Austria / Hungaria, only older examples. Please have a look! 3168 c inF Nice lot older coins the sought-after issues, as well it concerns an mainly about issues of the German empire. Also 12 gold coins are available. Please have a look! 3169 c inF Extensive lot silver coins with many beautiful copies of different areas, as well Canada, Austria, USA, Switzerland and so on. Including subjects as for instance olympic games. Very high trade value! Already the silver fineness amounts 3300 Gram. 3170 c inF German Demokratic Republik (East Germany), 10 Mk. 1988, athletics, silver coin in polished plate as a test (edition 1000 pieces), as well 20 Mk. Historic City seal of the city Berlin 1987, two variety in polished plate, silver, as a testn (edition always 2100 piece). All in two corresponding caskets with the certificates of authenticity. Rare offered and high trade value! 3171 c inF Interesting lot coins in the box, as well issues of different countries, numerous silver coins, issues of the German Reich, Federal Republic of Germany commemorative coins, as well also two gold coins from Belgium respectively Hungaria. Please have a look! 3172 c inF Extensive lot of coins from different areas, as well numerous old silver coins including Talers from Bavaria, Saxony, Austria and much further material, with also three gold coins. Please check carefully! 3173 c inF Interesting lot silver coins of the German empire with sought-after copies, with also 2 RM Anhalt 1876, three examples Baden 5 RM from 1906, as well 5 RM Hessen 1875. Interesting lot! 3174 c inF Interesting lot coins with useful issues, as well Federal Republic 5 DM Schiller, margrave from Baden, Eichendorff twice, as well also regular issue coinage sets from 1971 and 1973 in polished plate, besides Old German States / Baden thaler from 1778 (small handle trace) and so on. Perfect for liquidation! 3175 c inF Extensive collection coins of the Papal States, as well Papal States with numerous interesting issues, much older material, as well also the complete regular issue coinage sets from 1929 / 37, 1940 / 42, 1947 / 49 and 1958 / 95. An extraordinary collection with a lot of material and enormous acquisition price! 3176 c inF German Demokratic Republik (East Germany), 20 Mk. Historic City seal 1987, proof coinage, both variety in the corresponding casket with authenticity certificate. Edition in each case only 2100 pieces. 3177 c inF Extensive inventory coins packed in a carton, as well numerous issues Federal Republic of Germany including numis covers and so on. Please have a look!